So I wondered if the fault may lie under the top cover, so partly for the sake of curiosity and partly for the challenge I decided to take off the top cover. I have take a few cameras apart, this one proved fairly difficult. First off, open the back and hold the rewind rod still and unscrew the rewing knob. Now pull the rewind rod down into the camera and remove. Under the rewind knob is a slotted plate, this needs to be unscrewed, you could make up a special tool for this, but I used a fine screwdriver and little tack hammer to gently knock it loose. Unscrew the plate and it will come off with a large spring beneath. Now the ASA ring assembly can be removed. Now on to the rewind lever, Turn the camera over and you will see a screw on the underside of the rewind lever, remove it and the plastic cover will come off. Holding the rewind lever down is a nut, unscrew this and remove the shakeproof washer and lever. Under the lever you will see another slotted ring, again you can either fashion a tool to suit or gently tap it loose with a small screwdriver and small hammer. Now the hotshoe should be removed, to do this you first need to remove its cover plate and shim. The cover plate is hooked into a recess nearest the front of the camera, simply lift this front edge with a tiny screwdiver and slide the plate and shim back. Under the plate you will find four screws, remove them (note, two are shorter, make sure you note where the short ones go) The hotshoe should now lift off. On the subject of the shutter speed knob. This SHOULDN'T need to be touched. I removed the top cover and undid the two screws beneath, this was a mistake. These screws hold the knobs brass bearing plate in the right place. This meant it was a sod to get it all in alignment when I re-assembled it. 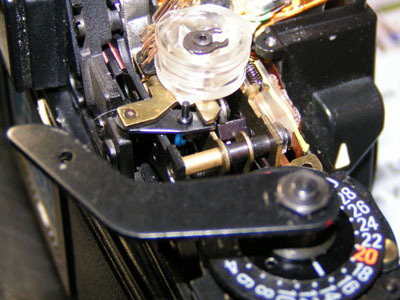 In theory the shutter speed knob should come off with the lid and its little operating peg should pull straight out of the plastic cam beneath. But I digress.. The cover itself can now be unscrewed. The cover has two screws on the back, one either side of the prism boss, one under the ASA knob. The cover should now lift off exposing all the electronics. As it happens there was no fault under here, so I put it all back together and surprisingly the fault still remains. If anyone reading this actually knows how to fix my fault I would be very grateful to hear from you. Re-assembly is (in time honoured tradition) the reverse of the dissasembly. As always YMMV and don't shout at me if you trash your camera.